The Swan Hill Club is centrally located in Swan Hill, Victoria. The Swan Hill Club is a non for profit community club which has been operating for over 100 years. The connection with the community runs back to 1911 when we first began to donate to worth charities and local organisations. 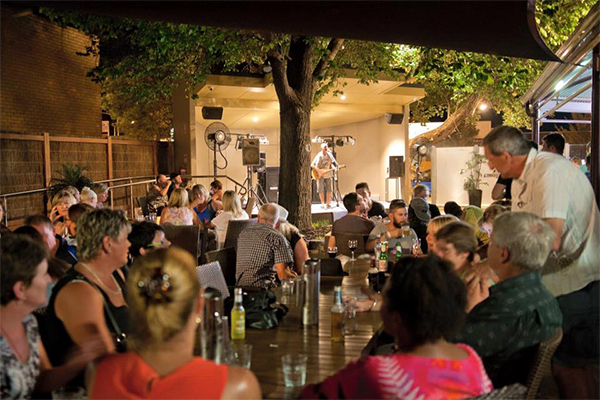 We are Swan Hill's home of live music with live entertainment every Friday night of the year, from local talent to national and international talent. Sunday Sessions run in the warmer Summer months with an afternoon of live music in the popular beer garden. There are 3 function rooms where regular functions are held from birthdays, engagements, AGM's, wakes, corporate events, presentations, training nights and more. The bistro is open 7 days, for both lunch and dinner provides affordable and delicious meals in a great atmosphere for leisurely afternoons and evenings with family and friends. Whilst the free courtesy bus runs nightly to and from your door to the Swan Hill Club venue, within the city limits. Swan Hill Club is operated by Murray Downs Golf and Country Club Limited which operate 3 businesses in Swan Hill; Murray Downs Golf & Country Club, Swan Hill Club and Spoons Riverside. Swan Hill Club and Spoons Riverside operate in Victoria, whilst Murray Downs Golf and Country Club operates over the bridge in NSW at Murray Downs. There are over 170 employees across the three venues in Swan Hill in a large range of roles including baristas, chefs, gift shop staff, to gaming managers, maintenance, Pro Shop staff, greens keepers, bus drivers, finance, kids room staff and much more.